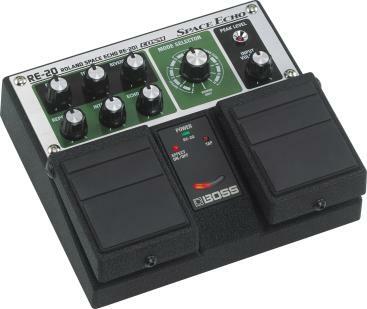 One of the most beloved echo effects ever made, the Roland RE-201 Space Echo, has been reborn as the BOSS RE-20 Twin Pedal. Unveiled at Musikmesse Frankfurt 2007, BOSS introduced the new stompbox at Namm summer session 2007 in Auistin, Texas. Recreating every sonic detail and nuance of the original, the RE-20 provides users with the warm, unpredictable and highly tweakable retro sounds of the RE-201. The original Roland RE-201, commonly known as the Space Echo, was an analog delay effects unit produced in the 70s. Despite its age the Space Echo is still widely sought after and used by many bands and recording engineers today. This twin-pedal features spot-on simulation of the Roland 201 with the spacious analog tone of the original Space Echo, including selection of the original 12 Space Echo modes. Faithful modeling of the 201’s tape flutter and magnetic head saturation give this new box an authentic tone while a tap input pedal allows musicians to set the time by foot for ease of use. The RE-20’s warm and gritty delay time is even longer than the original. An optional expression pedal like the BOSS FS-500L allows users to control parameters such as REPEAT RATE, INTENSITY and more, all in realtime.